I’m not sure this winter is ever going to end! We’ve had snow off and on along with cold weather for the last few months. 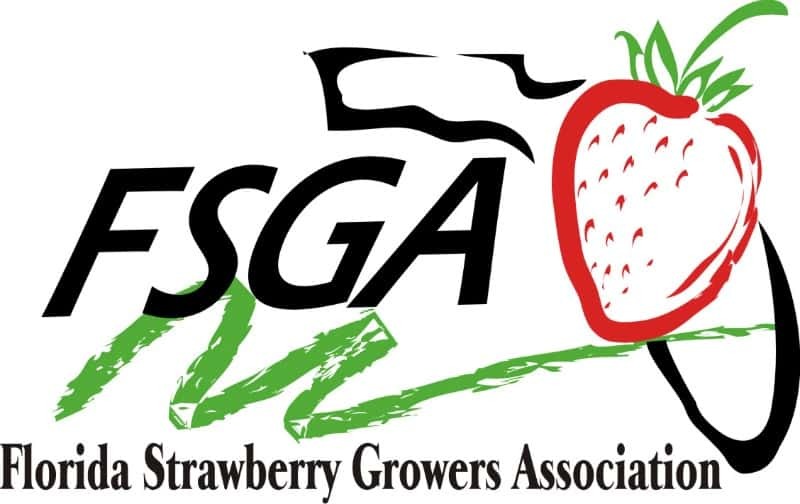 While it’s been dreary here in Maryland I’m glad it’s been sunny in Florida and that Florida Strawberry season is December through April! It helps to brighten up my day to know that these sweet, juicy berries are available when it’s cold outside. I do hate when April comes around because I know it’s the end of the season and that I won’t be able to get them again until December. That’s why I like to stock up now and preserve Florida Strawberries while I can. Every year I make a big batch of strawberry jam and can it so we can enjoy it through the summer and fall. I also tend to make and freeze strawberry sauce to use on top of ice cream or in desserts. I can always count on my local Weis Market to carry a variety of Florida Strawberries. I bought several pounds this weekend in order to can and freeze them. I know I don’t have many weeks left to buy them so I wanted to make sure I bought them while they are still available. 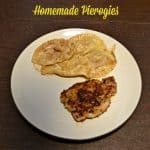 I started out with my strawberry sauce because it’s so easy to make. I usually take two pounds of strawberries and puree them along with some simple syrup. It makes a sweet, thick sauce that is perfect in desserts like cheesecake or on top of angel food cake. It’s easy to freeze in freezer jars or in quart sized freezer bags. I try to freeze it in one cup batches because that’s usually the amount I use at one time. Once I made and froze the strawberry sauce I was itching to use it. That always happens to me. I know it’s sitting in the freezer and I just can’t wait to use it. I decided to use one batch in my Strawberry Swirl Cheesecake. The cheesecake starts out with a graham cracker crust like all good cheesecake does. While the crust is chilling I made the actual cheesecake. To make the strawberry swirl in the cheesecake I poured half of the cheesecake mixture on top of the graham cracker crust then dropped spoonfuls of strawberry sauce on top of it. Then I poured the remaining cheesecake mixture on top and dropped the remaining strawberry sauce on top. 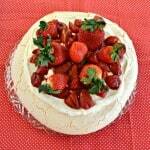 I then take a knife and swirl the strawberry sauce into the cheesecake and bake it. Once the cheesecake it chilled it’s easy to cut into slices and then drizzle with white chocolate and additional strawberry sauce. 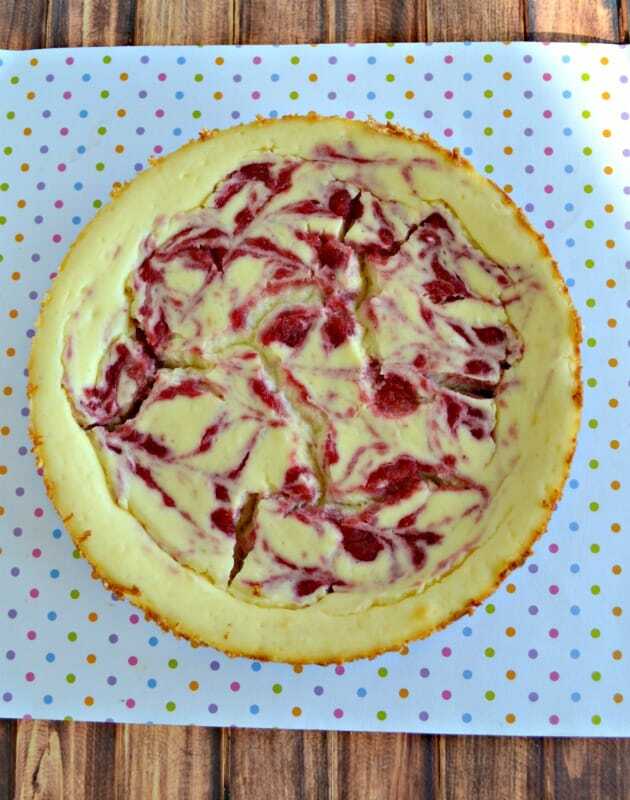 This cheesecake recipe is fairly easy to make but it looks and tastes like a million bucks! Plus it’s awesome to be able to enjoy the sweet Florida Strawberries any time of year using the frozen strawberry sauce. Make a delicious strawberry sauce that you can freeze and use for later. 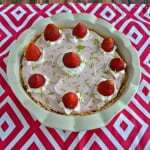 Then bake up a delicious strawberry swirl cheesecake topped with white chocolate and strawberry sauce. 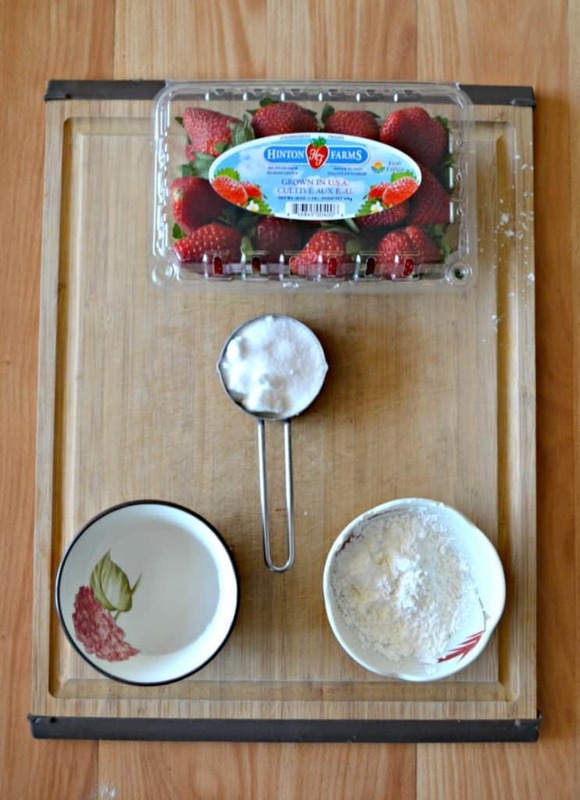 Place the Florida Strawberries, sugar, and cornstarch in a food processor. Process until smooth. Pour the strawberry mixture into a saucepan along with 3 tablespoons of water. Bring the mixture to a boil then reduce heat and simmer for 5 minutes while stirring frequently. Remove from heat and cool completely. When the strawberry mixture is cool divide it into two quart sized freezer bags, remove all air, and zip them up. 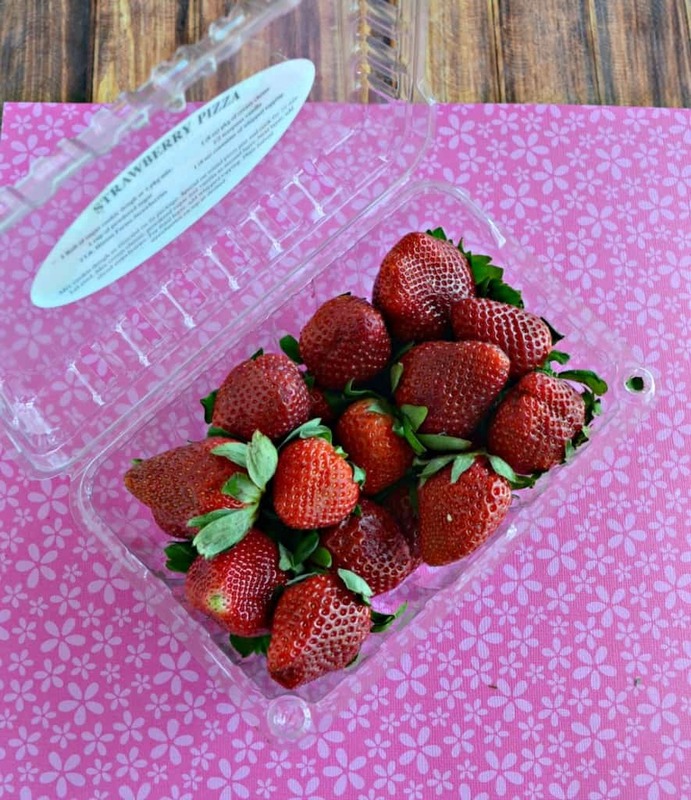 You can freeze this strawberry sauce for up to 6 months. To make the crust place the graham cracker crumbs, sugar, melted butter, and cinnamon in a food processor and process until it comes together. Press into the bottom of a 9 inch springform pan. Refrigerate until ready to make the cheesecake. To make the cheesecake place the cream cheese in a bowl and beat with a mixer on medium speed until smooth. Add in the sugar and vanilla and beat for 1 minute or until fluffy. Beat in the sour cream and lemon juice. Place the frozen strawberry sauce in a small saucepan over medium low and heat until just melted. Remove from heat. To assemble the cheesecake take the crust out of the refrigerator. Pour half of the cheesecake mixture into the springform pan. 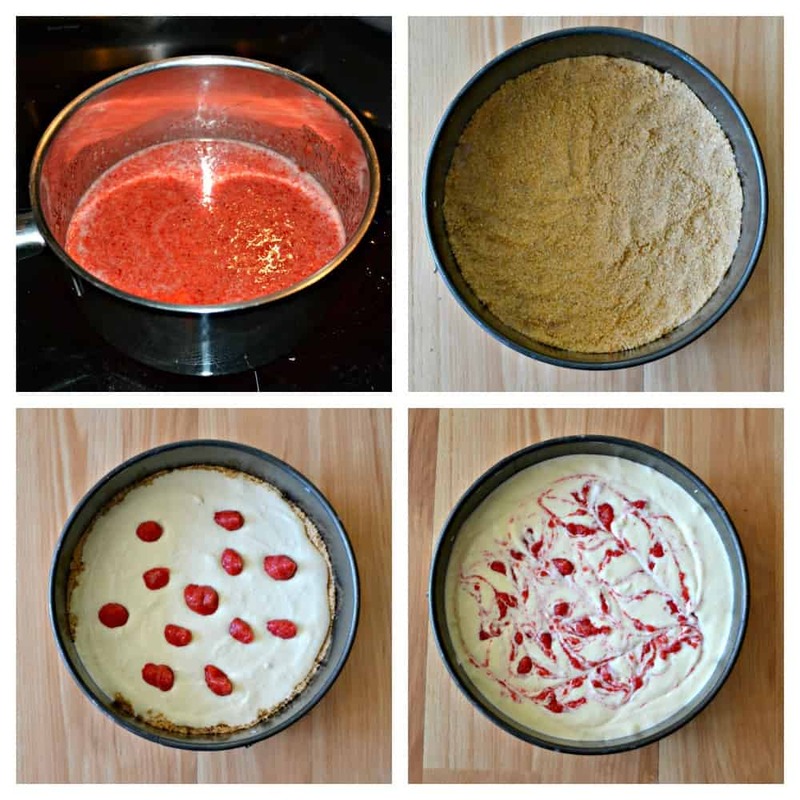 Use ⅓ cup of strawberry sauce and spoon on top of the cheesecake by teaspoon. Carefully pour the remaining cheesecake mixture on top of the strawberry sauce. Use another ⅓ cup of strawberry sauce and spoon on top of the cheesecake by teaspoon. Take a knife and carefully swirl the strawberry sauce into the cheesecake. Bake the cheesecake for 1 hour or until the edges are set but the center is still a little bit wiggly. Cool completely in pan on a wire rack. 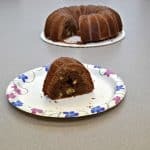 Once it is cool run a butter knife around the edges and release the cake. Refrigerate for at least 4 hours. When ready to serve place white chocolate in a microwave safe bowl. Heat in 20 second intervals stirring after each heating, until completely melted. Place in a zip top baggie and snip of the edge. 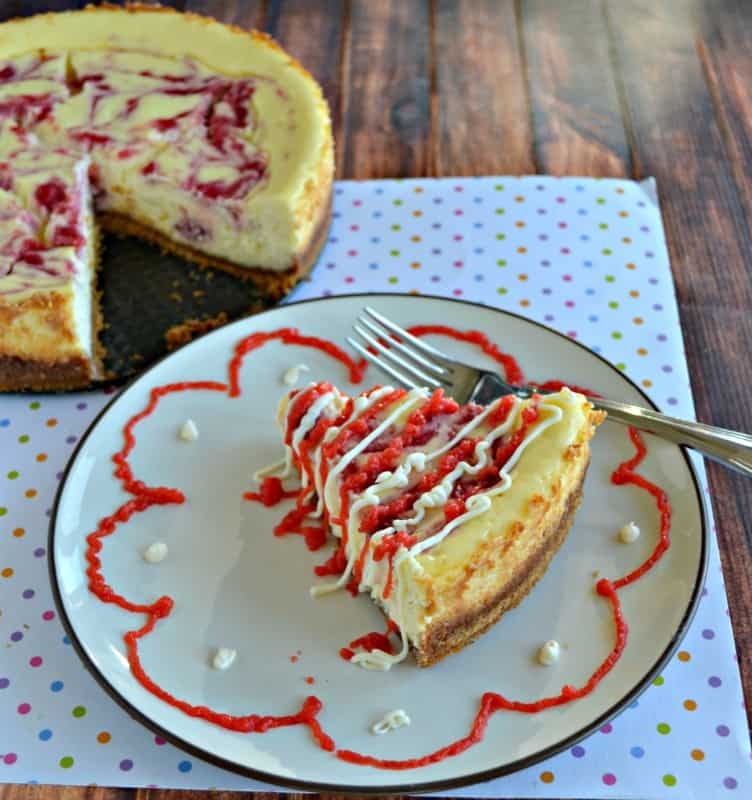 Cut the cheesecake into pieces and drizzle with the white chocolate and a spoonful of remaining strawberry sauce. You had my full attention with these pictures. I need to try the recipes! Oh, friend…THIS is my kind of cheesecake! 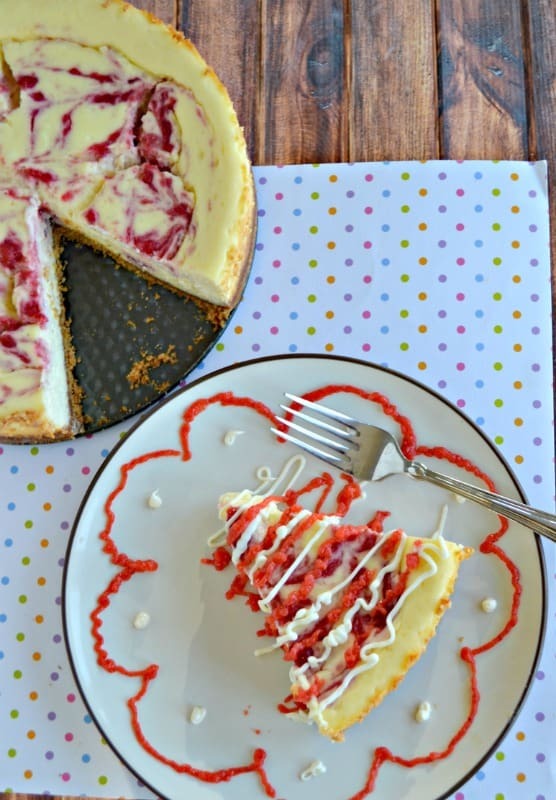 You can’t go wrong with the combination of strawberries and cheesecake!